MILLS RIVER, NC - Ready to tackle some projects during Home Improvement Month in May? 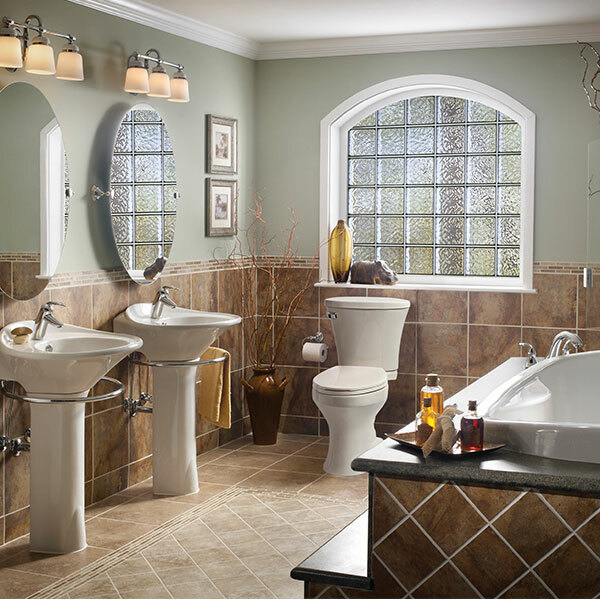 Industry experts recommend focusing on a room you spend a great deal of time in --- the bathroom. "Many homeowners don't realize how much time they actually spend in their bathroom," says Gary Pember with Mansfield Plumbing. "Usually it's the first room we walk into in the morning and the last one at night. "Transforming an outdated bathroom into a relaxing in-home retreat can bring many rewards for homeowners. Along with creating a comfortable place where you can unwind at the end of a long day, a bathroom makeover adds resale value to your home for the future." Pember recommends starting a bathroom home improvement project by evaluating the current condition of your plumbing fixtures and cabinets. "This may be the year to replace outdated fixtures with newer products that have more features and benefits, like a SmartHeight toilet or a soaking tub," says Pember. "There are a wide variety of impressive options to choose from, including chromatherapy mood light systems, thermotherapy heated backrests and in-line heaters that keep water heated perfectly. Any of these will enhance your bathing experience." As you're evaluating your bathroom, make sure to look at your windows. If they're located over a bathtub or too close to your neighbor's home, now's the time to replace them with acrylic block or decorative glass privacy windows. "People crave privacy in their bathrooms," says Laura Sikes with Hy-Lite. "One way to get that, while still allowing in natural sunlight, is to install obscure privacy windows. Available in an array of styles, these windows allow light into the room while preventing peeping eyes from seeing in while you're bathing or preparing for your day. "The really good news is that decorative glass and acrylic block windows come in both operable and fixed styles, so you're not sacrificing the ability to gain fresh air in your bathroom when selecting these privacy windows." To accent and upgrade the look of your bathroom, consider installing polyurethane trim, moulding and millwork. Because these products resist moisture, there's no warping of the pieces, no matter how steamy your shower gets! "On a limited budget you can give your bathroom an elegant facelift with mouldings around the ceiling and mirrors," says Anita Piety with Fypon. "This practical product is lightweight and easy to install. Whether adding a set of pilasters to flank a shower stall or chair rail and baseboard around the room, polyurethane pieces help give your bathroom a fast, elegant transformation." For product details related to bathrooms, visit www.mansfieldplumbing.com, www.hy-lite.com and www.fypon.com.